Kieran Timberlake Architects have been fighting for architecture to improve as other fields have throughout the years, quickly, cheaply, and smarter in design features. They have questioned why architecture is still done the same way that it has been done for years when professions such as ship building, automotives, and airplane engineering have bounded ahead with technological breakthroughs. 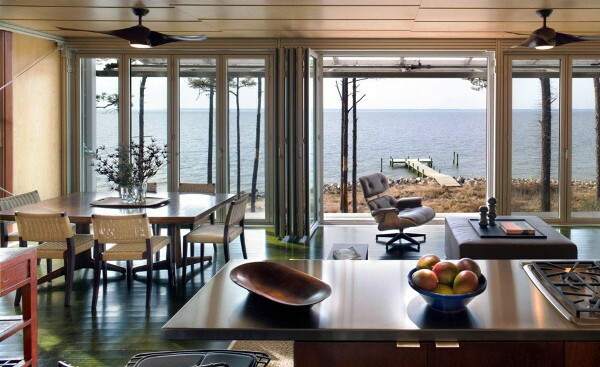 Finally, using their ideas of prefabricated parts for a building in new technological advances in architecture, are displayed in the design of Stephen Kieran’s family’s weekend home, the Loblolly House, located on Taylors Island, Maryland. This is an entirely prefabricated residence of 2,200 sq. 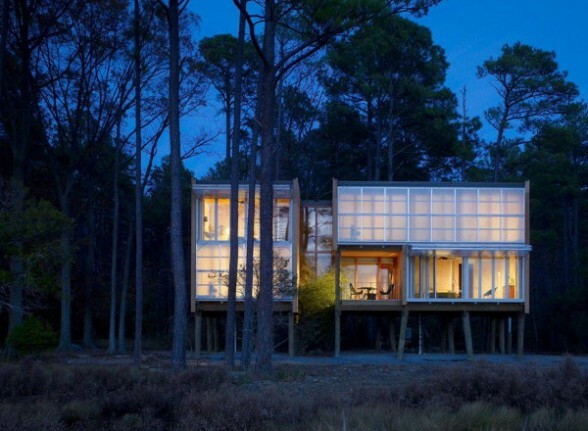 ft. on stilts, made up of Loblolly Pine to be one with its surrounding naturalistic elements. 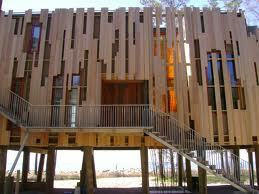 The blocks distribute radiant heating, hot and cold water, waste water, ventilation, and electricity through the house. Fully integrated bathroom and mechanical room modules are lifted into position. Exterior wall panels containing structure, insulation, windows, interior finishes and the exterior wood rain screen complete the cladding. The adjustable awning opens for passive cooling and also closes to store the sun’s energy for off-the-grid heat. The most unique aspect of this house, besides its assembly, is its ability to be disassembled. This allows for easy repairs, alterations, reclaiming and recycling of materials without a harsh impact on the environment. This truly is a house that blends nature and architecture and will leave a minimal footprint once it has been disassembled and its parts used in a new life. Kieran Timberlake Architects is on the leading edge of where architecture is heading with their use of prefabricated parts. The future holds no boundaries!